In October came the good news that 76% of ticket buyers for the Rest is Noise festival had not previously booked a contemporary classical music event at London's Southbank Centre. 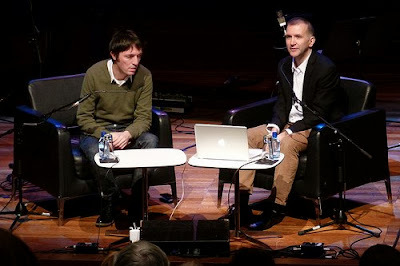 One of the highlights of the final month of the ground breaking festival was a discussion about the future of new music between Alex Ross, whose visionary book inspired the festival, and Colin Greenwood, the celebrated bassist of Radiohead - that is the two of them in the photo. As the Rest is Noise festival is, quite rightly, being cited as a case study in how to attract new audiences it is worth pointing out that Alex was born in 1968 and Colin Greenwood in 1969. This makes them 45 and 44 respectively, which compares with a median age of 48 for that archetype of the affluent senior citizen, the cruise ship passenger. Which is not a problem at all as it simply confirms what has been glaringly obvious for a long time: that classical music's audience is skewed towards older age groups who, like cruise vacationers, are typically higher income and college educated - Harvard for Alex Ross and Peterhouse College, Cambridge for Colin Greenwood. But, despite the glaringly obvious, classical music remains fixated on targeting a young rock oriented and non-elitist (Cambridge?) audience. This erroneous strategy is based on two misconceptions. The first is the Max Hole dogma; this says that because the rock music market is twenty times larger than that for classical, if classical reinvents itself as a sub-category of rock its audience will suddenly become twenty times bigger; coincidentally much to the benefit of Universal Music. The second misconception is more distasteful, namely that young audiences are cool and older ones can be written off because, to quote an Independent columnist, "...they'll all be dead soon". If we look beyond this pernicious nonsense, there are very sound reasons for classical music to target the grey haired market. The main one is, again, glaringly obvious: demographic and economic data shows that older age groups are the growth markets of the future, as illustrated by the graphic below which is based on UK government actuarial data. However, the misconception of a homogeneous and lucrative young market must not be replaced by the similar misconception of a homogeneous and lucrative grey-haired market. Classical music needs vibrant new young listeners as much as it needs sagacious new older listeners. Because, as has been explained here many times, the music audience is not homogeneous, but is an agglomeration of millions of individuals of widely varying age and tastes. But the centre of gravity for the classical music audience is, always has been, and will continue to be over 40. And that 40+ group is where demographics and economics tell us that the future opportunity lies. So why do industry experts refuse to accept this and, instead, continue to pursue at some considerable cost a younger market that is, at the worst non-existent, and, at the best, declining? Also on Facebook and Twitter. Header photo via SoundMaven and market graph is via Inclusive Design Toolkit. Any copyrighted material is included as "fair use", for the purpose of study, review or critical analysis only, and will be removed at the request of copyright owner(s). To be painfully honest, I think because deep down, looking out and seeing a younger audience makes US (the classical performers) feel cool! Great article. In my own efforts, I've had to focus not on what I wanted the audience to look like, but rather what I wanted them to experience. As a result, what's been happening is certain of those varying demographics are seeking out the same experience and voila, you have a diversified audience, in both age and ethnicity. And I must admit, to look out and see that diversity does make me feel very cool :) Thank you for this piece. Twp ways of looking at it. First is the safety hazard. Second, I am with great connoisseurs of great music...maybe I am a connoisseur too. Many of the attendees are or were music teachers...and some of them were on speaking terms with exalted musicians. It is an elitist stance. But I am past caring - and I pay my taxes.